"FS2 at Hummingbird has been very beneficial for N***! A smooth transition from FS1 at Hummingbird to FS2 enabled him to focus on learning and not having to worry about a new environment, teachers and friends. Miss Jodie has led and nurtured N*** into becoming a bright, educated and confident little boy ready for Year 1! " "We would like to express big thanks to Mis. Brenda and the whole nursery team for making Mia’s time super enjoyable – even though Mia has spent only three months in the nursery, we see positive signs in her development, and more importantly, she was indeed happy waking up knowing that she will see her teachers and friends! As parents, we couldn’t be happier with our decision to enrol her into Hummingbird and we hope Mia will also enjoy her time in the preschool. " "As a working mum it’s not always easy to be around during important milestones or moments… so yesterday was that much more special. Junaid celebrated his last day at Hummingbird Nursery Bay Square where he has been since 18 months and how he has grown! Thank you to all the teachers and teaching assistants who helped Junaid grow into the child he is today. Your hands have been there when mine couldn’t, to guide and support him along the way. Thank you, Miss Andrada, Miss Yasmin, Miss Vera, Miss Leah, Miss Emy, Miss Angie, Miss Sophia, Miss Eva. Thank you for helping him grow <3 "
"We chose HB in Bay Square because it was the closest British Curriculum nursery to our building and also it was recommended by another mother who had her boy at the nursery. Even though the major reason we moved there was our convenience, we were really surprised to find out that the nursery was amazing! We have our 2 boys there and we are really happy and satisfied with everything! I believe that our kids receive the best they can get for their age at this nursery. Our kids learn to share, to listen, to be part of a team, to use the bathroom etc. The monthly themes are exciting even for us the parents and the kids learn so much…They are so happy to go to the nursery and they leave with a smile every day…The Facebook page with photos of the week is so exciting and me and my husband are anxious to see them every Thursday… The activities offered are very interesting…our boys love soccer and looking forward for the Sunday lesson.. The workshops and parents open days organised throughout the year are also very important and bring the parents and teachers closer… The teachers and all members of staff are awesome, always pleasant and consist of a great team. They give attention to all parents and kids and are always following our instructions and requests. The nursery has really nice layout, a jungle gym and 4 classes for each year group. Our kids love the colours, the toys, the atmosphere and this pleasant environment. Last but not least, the location of the nursery is really good. It is in a lively business area full of cafes, restaurants and corporations. The regular walk organised outside is really nice for our kids and they enjoy it so much. Our kids talk about it every time and they tell us what they see and what they do…This is really important for our kids to breathe fresh air during the good months of Dubai before they are closed back to the air-condition in the hot months. I would definitely recommend the HB at Bay Square because I feel that it is the right place to leave your kids and go to work. It is really suitable for working parents because of its location, the long opening hours, flexibility, catering services and safety. " "I cannot recommend this amazing nursery enough. My daughter has really flourished and every single staff member is like another mommy to her. They are incredibly loving and caring and completely open about everything that happens – from minor scrapes to how their day was and how they are progressing. ~ Mum at Hummingbird Nursery, Bay Square "
"I would like to thank Hummingbird Nursery for taking care of my newborn, Rafaella (4 months). You provided us with stability, your qualified and well-experienced staff took the time to know us and our child. I would like to thank Grandma, Nurse Mai, Nurse Rona, Ms. Holly and Ms. Jessica for always being extremely helpful, very kind, very caring and patient when answering all my questions. I couldn’t have imagined keeping my job without you – Rafaella is as safe at Hummingbird Nursery as she is at home. You are without any doubt the best Nursery in the country. I can’t thank you enough for taking care of the most precious person in my heart. 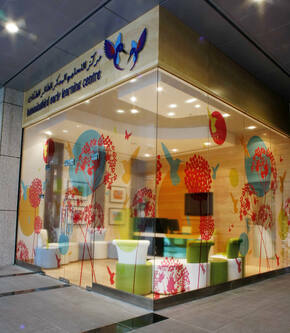 We Love you Hummingbird, ~ Parents at Hummingbird Nursery, DIFC. " "Elly has been at Hummingbird since he was four months old, he smiles every morning when he is picked up by Marites. As a working mother, I feel confident that my child is looked after by trained staff and comforted in knowing that he is happy and learning every day. The management is lovely and a pleasure to deal with. I can highly recommend Hummingbird. " "Obviously for any parent, finding the right nursery for your child is unsettling, and having sent both my boys to Hummingbird, I know we 100% chose the right one… Being a working mother, the fact that the nursery is in the same building to my office is a huge bonus. It was difficult enough going back to work, but knowing that I could go and visit them, and take them out anytime throughout the day made my return to work so much more bearable. Now, both boys (now aged 1 and 3) are so excited to get to nursery each day – they love it! Their development has come on so much from the great care they receive from each teacher. From walking to talking to potty training to preparing them for school – they are learning new skills and words each day. Thank you Hummingbird for giving my boys a great start in life. " "I would like to take this opportunity to share with you how pleased I am with the nursery and the provision that is being provided at Hummingbird. Even though Finnley is only there for 2 afternoons per week, I have always felt that the staff know and understand him and are aware of his individual needs. For me as a mum it is really reassuring to know that he is happy and safe when he is there. The staff at all levels are always accommodating and welcoming. I especially appreciate Finnley’s teacher telling me if there have been any problems or if he has learned something new when I come to collect him. I really do feel that the nursery works in partnership with the parents. I am delighted with our choice of nursery for Finnley and just wanted to thank your team. " "I went back to work when my daughter was 4 months old and Hummingbird definitely helped me throughout the transition. At first I was hesitant and thought maybe I don’t need to work anymore, but seeing how happy and relaxed my baby is has made me more at ease about it. I love how friendly, professional, and approachable the staff is. I love the exposure my baby is getting and appreciate that she’s learning something new every day, socialising and making friends while being in a healthy, safe environment. Thank you Hummingbird for answering all of my questions and for making multitasking a lot easier. A big shout out to all super mama’s out there "
"Both my kids have gone to Hummingbird as soon as they started walking, and soon the littlest one will be going to big school. They have both been very happy, the older one continues to go for after school activities which she looks forward to every day. And hopefully they will continue to go to after school activities and summer camps until they are too old! Hummingbird’s staff are great. My kids feel like it’s a second home, which makes me very happy that they are so comfortable yet learning so much through a great mixture of activities and play "
"As most parents find, going back to work after having your first child, is always daunting, and when my daughter was 5 months old I was faced with the guilt and anxiety of returning to the office. I didn’t need to worry, my daughter settled into the Hummingbird very quickly, and nearly 18 months later she is still very happy there, and on many occasions hasn’t wanted to leave at the end of the day! Having her so close to me, as I work in the DIFC, has been an added bonus and being able to pop down whenever I have a moment has been priceless. She continues to enjoy it, has learnt a huge amount and is a very happy toddler. We are also going to be sending our second daughter there when she is 4 months old, and knowing how good the staff are and how well they have looked after my eldest, it has made the prospect of returning to work a lot less daunting and almost guilt free – I cannot thank the teachers/staff at Hummingbird enough! " "As DIFC working parents we had concerns about our daughter going to nursery as a 14 week old. We did not need to worry! Hummingbird was amazing. The care, love and developmental guidance they gave to her and to us was exceptional. Our daughter spent over 3 years in Hummingbird and even wanted to go on weekends! The educational aspect exceeded our expectations and we now have a very confident, happy, social and well-adjusted little girl. She loved her monthly topics, show and tell, the jungle gym, French, music and ballet lessons and the excursions were always a favourite experience. Additionally she made some lovely friends who became so important to her. The staff were always absolutely wonderful and I cannot praise them enough, they guided us through her development in a professional and caring way. I cannot recommend Hummingbird enough. Thank you so much and we already miss you all! " "I have 2 children at Hummingbird and they both love it. The facilities and the staff are fantastic – approachable and very professional. I feel very comfortable dropping them at Hummingbird as I know that they will not only receive great care but their social and educational development needs are taken care of too. I highly recommend Hummingbird "
"I just wanted to say formally in writing how wonderful Miss Christine has been, she truly is an asset to the nursery. Miss Christine has been so kind towards both Lily and I. The transition back to work for me and Lily was tough as it happened so quickly but Miss Christine was so lovely, her gentle nature and kind words settled both Lily and I. I can’t thank her and the nursery enough for the wonderful way she has handled Lily (and me!) "